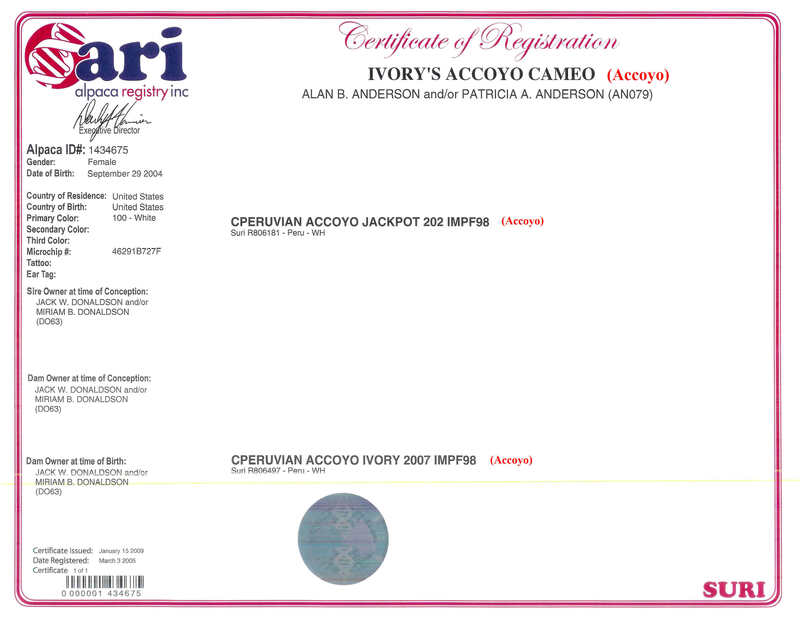 Accoyo Jackpot was imported in 1997 from Peru, and he left his mark in the production of tightly locked and colored full Accoyo suris. He sired numerouse champion offspring which have become foundation breeding for many farms. Jackpot was owned in syndication with a number of breeders. Ivory is a beautiful Full Accoyo import female with great conformation and very nice fleece even at the age of nine. 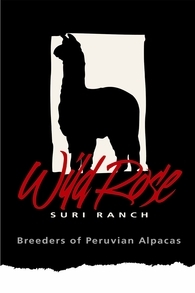 She has been a consistent producer of cria that have the same great conformation and even better fleece and coverage than she has. Ivory is an easy breeder and a great mom. She is very attentive, always has loads of milk, and has no trouble birthing. Ivory has designated herself guard of the farm and is very good at looking out for the rest of the herd -- a true grand dam. Cameo is one of the last full Accoyo daughters to have been produced by the now deceased Accoyo Jackpot from Don Julio's Barreda's infamous Accoyo breeding program. Jackpot was a white, multiple Get-of-Sire winner who consistently produced champions with high luster and uniform lock. Cameo is strong-boned and conformationally correct with the locks, luster, and coverage breeders expect from the Accoyo bloodlines. She is an outstanding foundation dam, having produced a beautiful daughter, WRSR Accoyo Jewel, out of Accoyo Ramilo's Producto in Sept 2007. 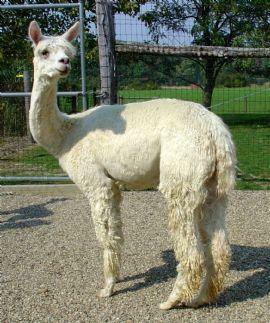 Her 2009 cria is Accoyo Jakarta by Accoyo Apocalypse, a gorgeous female with very fine fiber and great conformation. 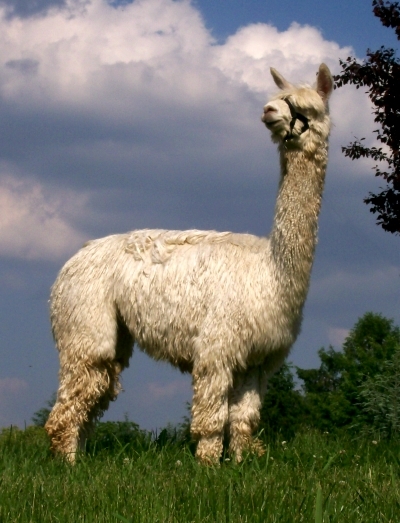 In 2010, she delivered a high luster male cria by NGG Accoyo Diamond Man. 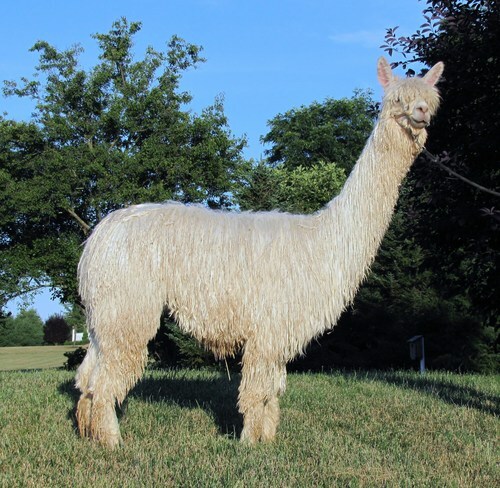 Cameo is an excellent mother producing tons of milk, rebreeding quickly on the 1st cycle, and easily delivering her crias. She has a great disposition and is a pleasure to have on the farm. Cameo is currently open and comes with a complimentary breeding to any Wild Rose herd sire along with up to 45 days board during breeding and a confirmation ultrasound.. Call Patti at 443-740-4240 for more information on this beautiful foundation dam.